Title: For Irish Freedom & Working Class Power! March 16, 2019, Cabot, Vermont -Just over 100 years ago, the Irish people rose up against the British Empire and declared a Provisional Republic. The Easter Rising in and of itself failed to end the colonial occupation of Ireland, but it marked a turning point in Irish history. While it would take the Irish people (and the IRA) until 1922 to establish the Free State for 26 of its 32 counties (and while groups such as RIRA continue to fight for the liberation of Northern Ireland to this very day), from the time of that Easter revolt, the days of direct English rule over the whole of the island were numbered. 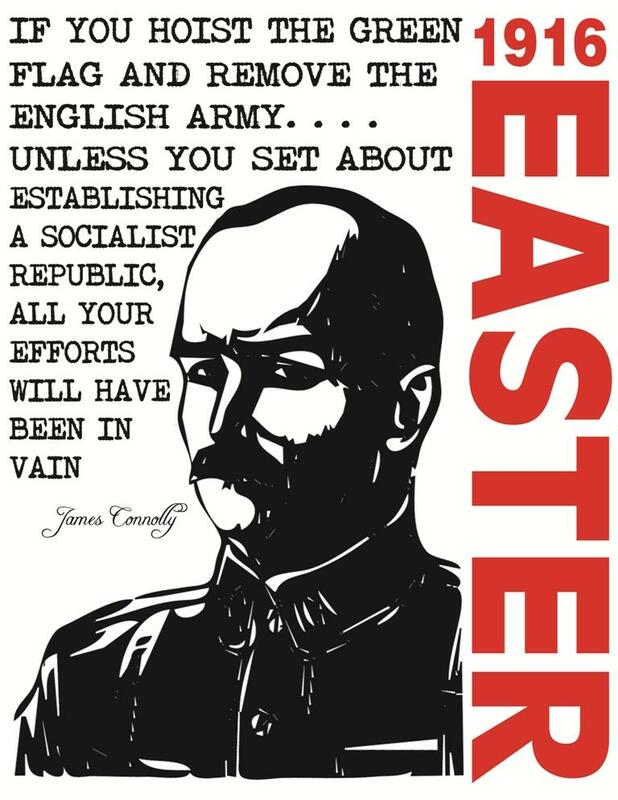 One of the paramount leaders of the Easter Rising was James Connelly. Connelly, a socialist, was a popular Labor leader affiliated with the Dublin based Irish Transport and General Workers Union. Previously, while briefly living in the United States, he was a dues paying member of the anarcho-syndicalist Industrial Workers of the World. In Ireland, he founded the Irish Socialist Republican Party. Later he was a co-founder of the Irish Labor Party as well as the armed Irish Citizen Army. The Irish Citizen Army, prior to engaging the British during the Easter Rising, was formed to protect and defend workers, especially during Labor strikes. Connelly argued that expelling the English from Ireland could not be the only goal. Instead, he asserted that economic emancipation of the Irish working class and poor must also be a primary focus of the anti-colonial struggle if the common people were to be inspired to sacrifice for the freedom of the many. And here Connelly maintained that a truly free and united Ireland, one devoid of English rule, must also entail working people having direct control over the basic means of production and the institutions that give form to the social & economic conditions through which they live. Connolly, in short, was a Labor leader, socialist and a far thinking revolutionary. During the Easter Rising of 1916 Connolly’s Irish Citizen Army collaborated with fellow armed groups such as the Irish Republican Brotherhood, Irish Volunteers, & Cumann na mBan. When the first shot of the revolt was fired, it was Connelly who commanded all armed groups in Dublin. Connolly and the Irish rebels were able to hold parts of the capital for six long and bloody days against massively superior British forces. During the fighting Connolly was seriously wounded. Soon after, he and other leaders of the Rising were executed via a British Army firing squad. The execution of James Connolly and other republican leaders sparked outrage among the Irish public and international condemnation. It is told that these executions inspired thousands of working class Irish to actively support the fight against English rule and to share the dream of a united Ireland free of the exploitation of any ruling class (be it British or domestic). Their struggle witnessed the significant (though be it limited) victory of 1922, but the dream is yet to be realized in its totality. So on this St Patrick’s Day Eve, I offer solidarity with those who continue to fight for a free and united Ireland (such as RIRA), and solidarity with all those throughout the world (including the YPG/YPJ & EZLN) who continue to struggle against bigotry & fascism, for self-determination, and for true working class power. United, we will win!